Style and Drive Type: Sedan. Power: 2.0 liter 4-cylinder turbo engine making 360-hp with a maximum torque of 331 lb-ft. Transmission: AMG SPEEDSHIFT DCT 7-speed sports transmission. 2.0 liter 4-cylinder turbo engine making a whopping 360-hp with a maximum torque of 331 lb-ft. Mated to an AMG SPEEDSHIFT DCT 7-speed sports transmission and all-wheel-drive, the CLA45 AMG runs from 0 to 62 mph in just 4.6 seconds with a top speed of 155 mph. Those are some astonishing numbers! 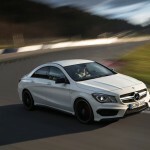 At the 2013 New York Auto Show earlier this year, Mercedes-Benz unveiled its new CLA-class along with the high-performance version – the CLA45 AMG. The Mercedes-Benz CLA-Class brings the brand into a segment in which it has never competed – fighting with the likes of the BMW 1-Series and the Audi A3. 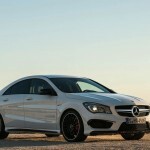 Being a sports car focused site – we decided to take a little look under the hood of the Mercedes-Benz CLA45 AMG. So how fast is this 4-cylinder engine and how does it stack up to the competition? 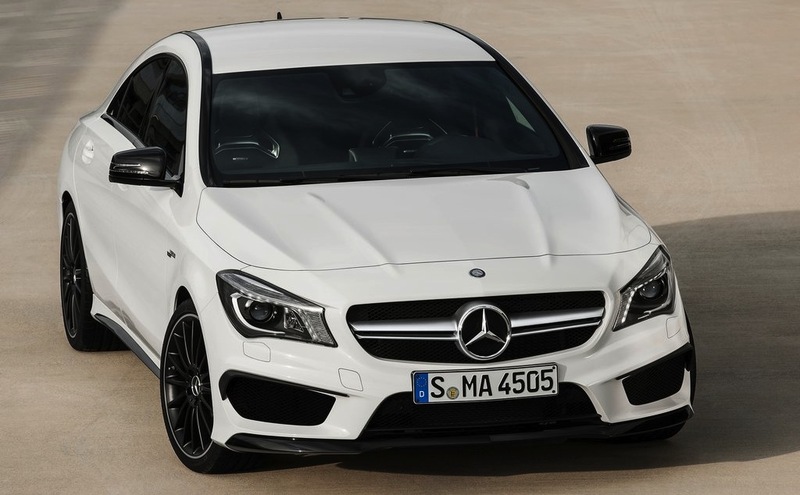 Power for the Mercedes-Benz CLA45 AMG comes from a 2.0 liter 4-cylinder turbo engine making a whopping 360-hp with a maximum torque of 331 lb-ft. Mated to an AMG SPEEDSHIFT DCT 7-speed sports transmission and all-wheel-drive, the CLA45 AMG runs from 0 to 62 mph in just 4.6 seconds with a top speed of 155 mph. Those are some astonishing numbers! In comparison the BMW 1 Series M Coupe uses a 3.0 liter 6-clyinder twin-turbo engine to make 335-hp allowing it to hit 62 mph in 4.9 seconds and the Audi S3 uses a 2.5 TSFI 5-cylinder engine to make 340-hp allowing it to hit 62 mph in 4.7 seconds. The Mercedes-Benz CLA45 AMG also features some interesting controls to enhance performance. One is a system called Momentary M Mode (nothing to do with BMW), which features a C Mode and S Mode. In C and S mode, the driver can activate manual mode (“M”) without having to remove a hand from the steering wheel, by pressing the “up” or “down” shift paddle once. The shift times in manual mode “M” and with Sport mode “S” activated, are similarly sporty in character to those of the SLS AMG GT supercar. 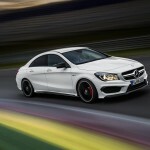 Mercedes-Benz will also offer a 3-stage ESP and ESP Curve Dynamic Assist on the CLA45 AMG. The three ESP stages enable the driver to change the dynamics of the sports car to his/her taste. The ESP Curve Dynamic Assist complements the ESP system perfectly. During dynamic cornering, braking intervention on the inside wheel gives rise for a moment around the vertical axis, resulting in very precise cornering. As if the short wheelbase wasn’t already benefiting the CLA45 AMG, Mercedes engineers decided to take it a step further. 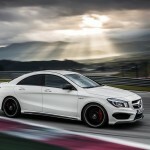 Pricing wise, there is no official word as to how much the CLA45 AMG will cost. However, we can expect it to come in at least above $45,000 – which may be hefty but considering all the performance you’re getting – it’s definitely not a bad deal. Look out for sales to begin during the later part of 2013. 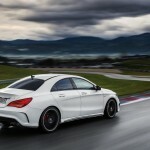 While the Mercedes-Benz CLA45 AMG looks outstanding on paper – time will tell if it lives up to the hype. We’ll try to get our hands on one and let you know. « Jaguar SUV is on the brand’s radar! What are your thoughts?